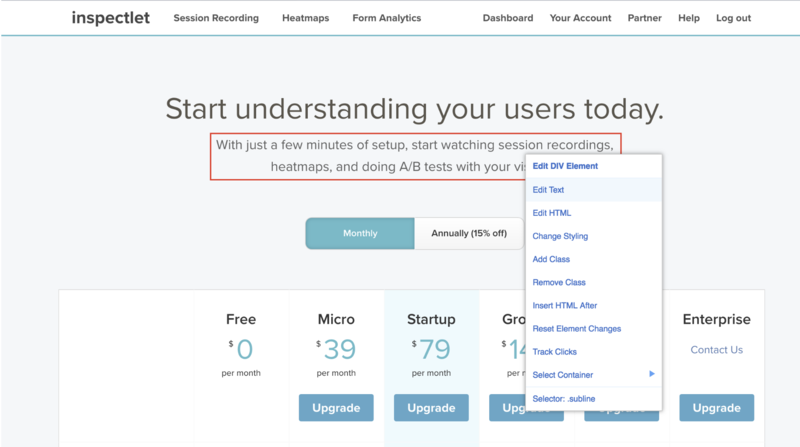 See exactly how the error happened in the first place by watching a user’s entire visit with session replay. If you have any questions or feedback about this feature, please send us a note at hello@inspectlet.com. We are pleased to announce that Inspectlet now automatically identifies when users experience moments of frustration while using your site aka rage clicks. A “rage click” is logged when a user repeatedly clicks in a non-interactive part of the page, usually indicating frustration or confusion. Common points of user rage include clicking on dead links (text that looks like a link but isn’t), clicking on images hoping to enlarge them (unsuccessfully) and other points of UI confusion. 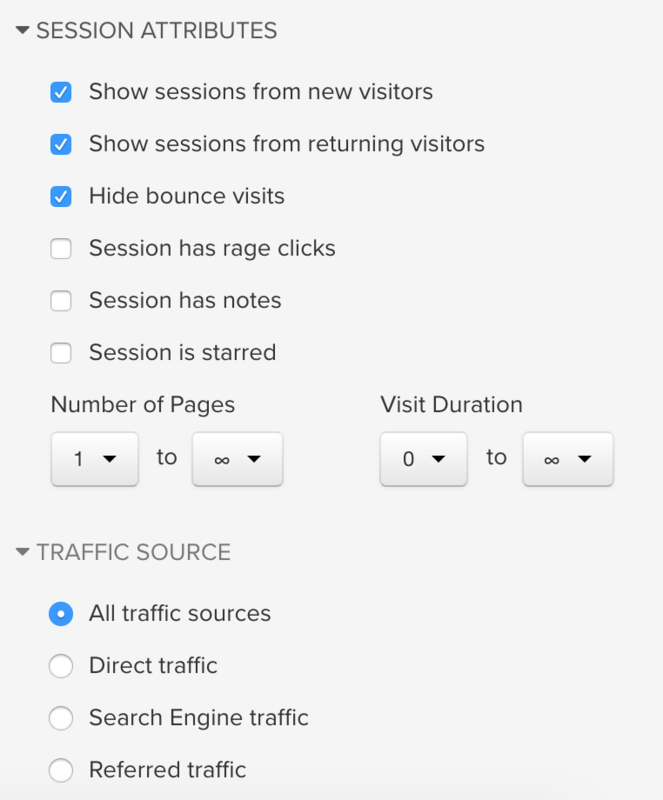 Rage Clicks are logged as session-level events and can be used to filter for sessions via session recordings page. For more information, check out our docs. Compare My Move is an online comparison service for home and office movers looking for quality removal companies in the UK. It ensures that users receive a service tailored to their specific requirements; whether they need packing supplies, dismantling services, or simply to keep some boxes in storage. The digital content team use Inspectlet on a weekly basis to monitor how users interact with their online forms. This allows them to not only see issues that would otherwise go unnoticed, but also how improvements can be made to the site, such as copy and how forms are presented. 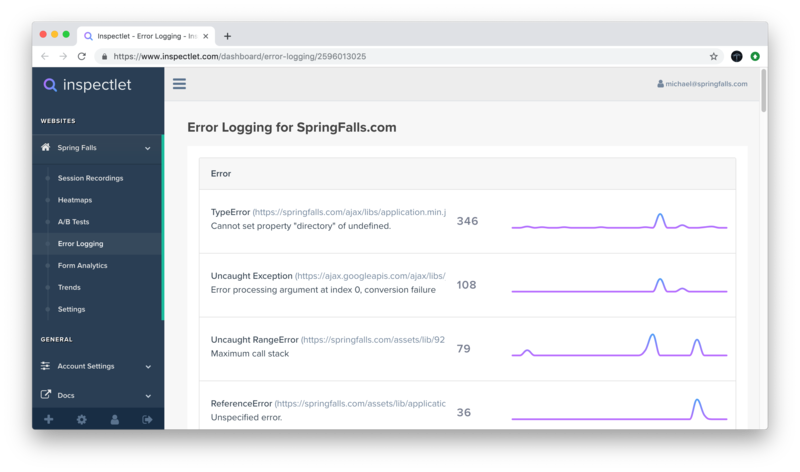 Inspectlet has helped the content team focus on the use of desktop or mobile devices, and use filters to search for certain sessions or issues identified in the backend. Data filters also help the Compare My Move digital content team gain insight as to why conversions are down during a specified time period; they then report back any technical issues to the web development team. Matt Toner, Senior Web Developer at Compare My Move, explains how Inspectlet has helped to identify development issues with regards to the company’s online forms. ‘’We gain a better understanding of how people use our site and where improvements can be made’’. ‘’Rather than having statistical data, we can visually see what people are doing and where we can make improvements’’. ‘’The ability to view these stumbling blocks for users means that, if, for example, 40% of users are not interacting with a certain field in the forms, we can re-evaluate whether it’s necessary and either remove it or make it easier for users’’. 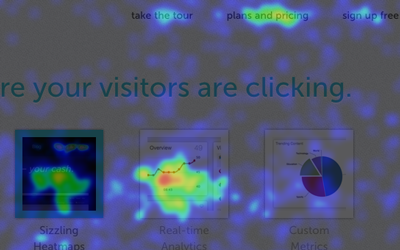 ‘’With regards to our heatmap analysis, we can check where most people are clicking in order to optimize our Call-To-Action button’’. Overall, Inspectlet has helped Compare My Move visually pinpoint any issues that need to be addressed, and effectively improve them. Increased Data Retention Across the Board – Introducing our New Data Retention Policy! The new data retention policy is in effect immediately and gives you the ability to hold on to all your data for significantly longer, compare user behavior trends from different time periods, and observe the effects of long-term changes and improvements to your site. Click here for more information on data retention per plan. 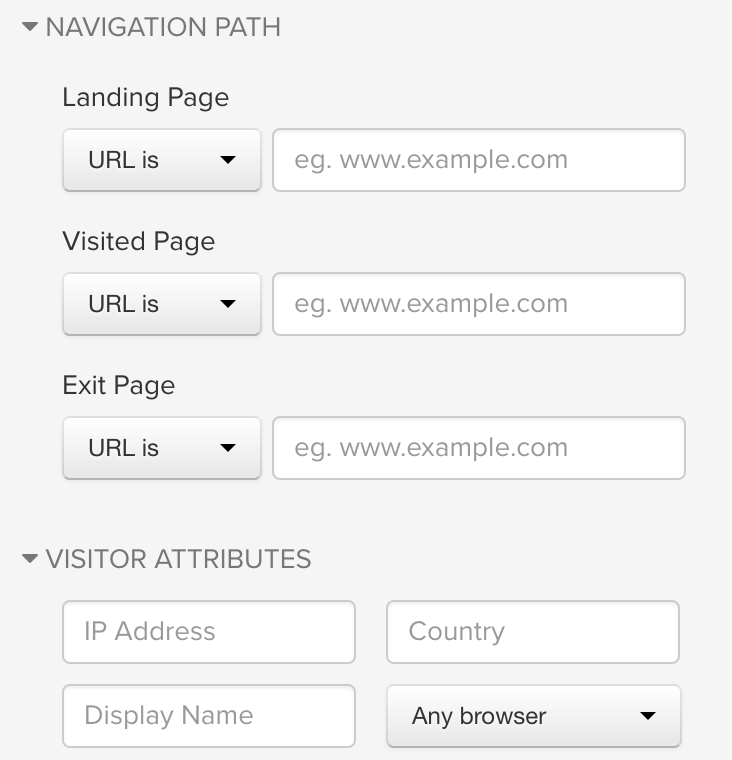 We are happy to announce the Inspectlet’s newest insight feature: Visitor Typed Search! 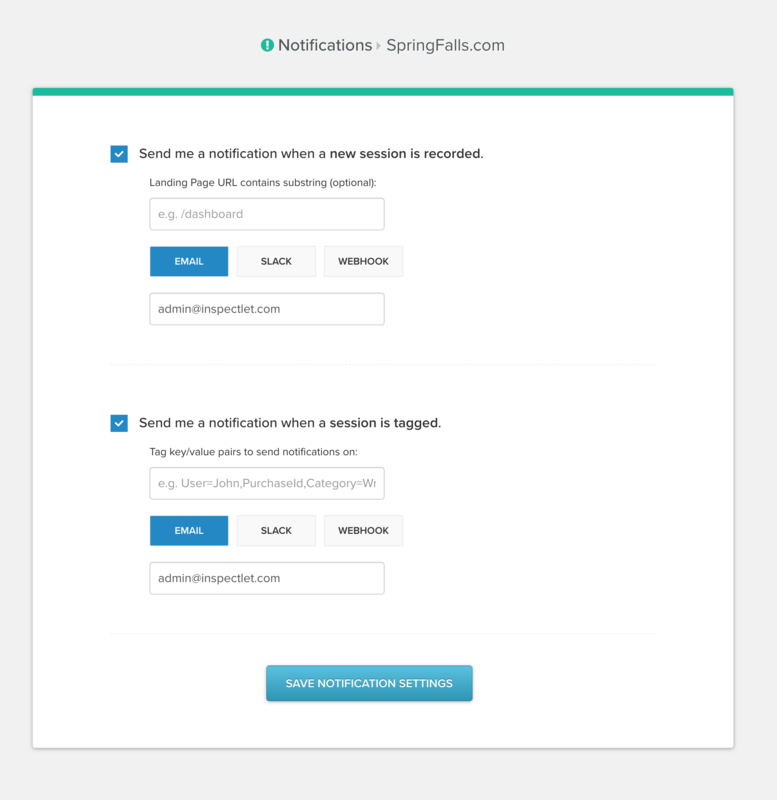 Inspectlet’s Visitor Typed Search feature allows you to delve deeper into your recorded sessions by searching for any text your visitor typed. Many of these visitors search products through the search bar that leads them to conversion, or used their name during the checkout process so you can look them up easily. 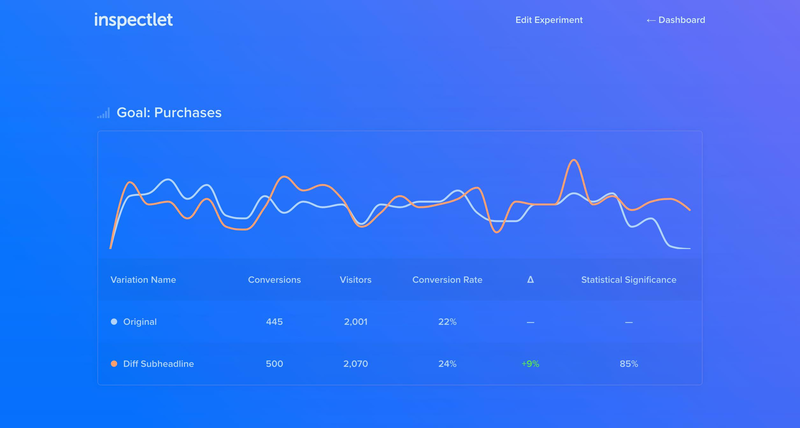 You can now track these conversions by looking up product names and people by their name effortlessly. For example, if you are a hotel website and want to know data about which cities and types of accommodations your users are searching for, the Visitor Typed Search function will allow you to easily do a targeted search for specific users. You can look up users based on the key terms they used such as City Name, Number of Occupants, Date, Type of Room, Etc. 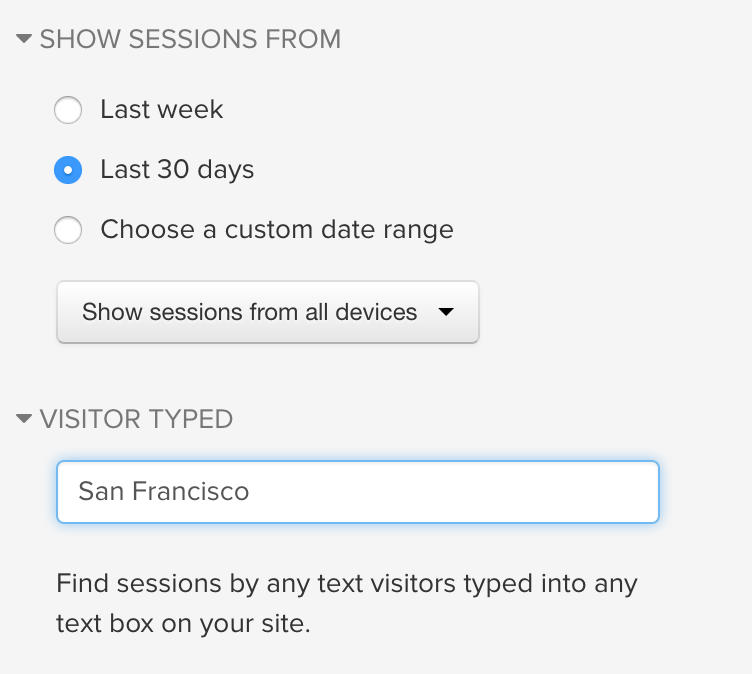 For example: Doing a search of San Francisco will show you all sessions where your user typed the word San Francisco while on your website. Similarly if you have an online clothing store you can track which products your users are searching for most and how they are interacting with the different styles or designs you offer. By using the Visitor Typed Search feature, you can track a user’s full visit of how they came to a certain product page and which product they were most interested in. Examples of searches could be: Sequins, Denim, Halter, Maxi, Polka Dot etc. 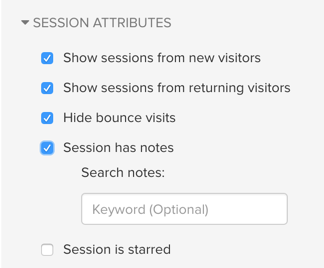 Similarly when looking for a session made by a particular customer, you can use the Visitor Typed Search to find their session based on their name. This feature allows you to gain a deeper level of understanding on the popularity of the products your company offers. By pinpointing the merchandise that is generating the most traction, you can streamline your sales process. To start using Visitor Typed Search and gain detailed insights about your users, try Inspectlet for free today! 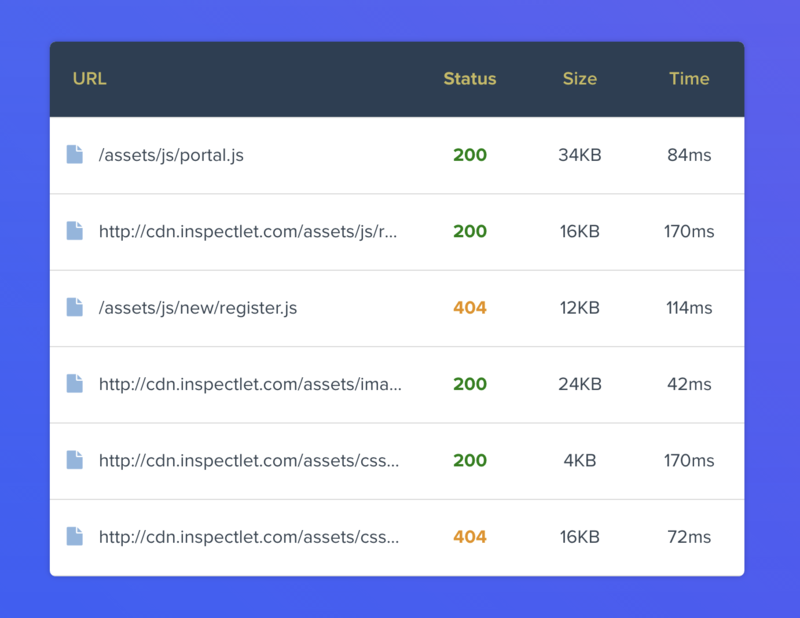 We’re incredibly excited to announce the release of the Inspectlet API! The Inspectlet API lets you retrieve and search your Inspectlet data via a JSON-based REST interface. All requests to the API are signed with HTTP Basic Authentication, you just need an API token to get started. To get your API token, please login to your Inspectlet account and look under “API Credentials” on the Your Account page. 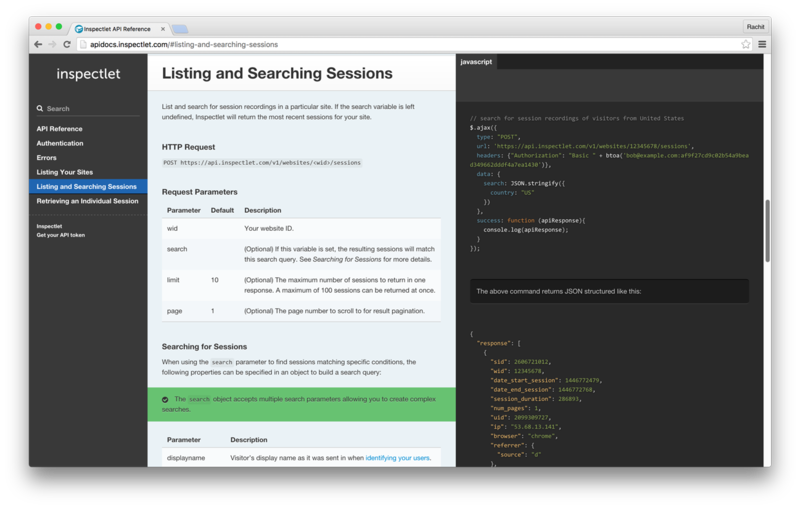 To learn more and get started, check out the full API documentation. We’d love to hear about how you’re using the API! If you have any questions or comments, please don’t hesitate to get in touch with us at hello@inspectlet.com.